Here’s a recent radio piece, from Rivet Radio, on our restoration! We are thankful for so much this year: thankful for our community; thankful for our commitment of patience, curiosity and flexibility during this time of change; and thankful that our spiritual home is being restored and renewed for the century to come. These photos from mid-October, capture work on the Unity Temple skylight. Bob Score of Harboe Architects reviews the work inside the Unity House skylight with Brad White of UTRF and Alphawood Foundation. 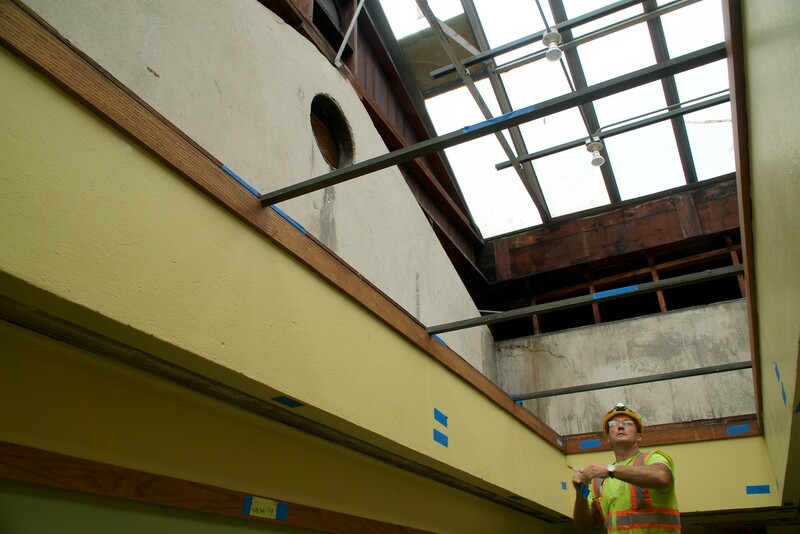 Reviewing the condition of the plaster inside the Unity House skylight. Much of the wood trim has now been removed from the sanctuary. These photos also appear in the November issue of CONNECTIONS. Dan Crimmins and Rev. Alan Taylor at pulpit in sanctuary. Steve Kelley on exterior scaffold holding chunk of concrete. View of “dance floor” in sanctuary from open window on north side. 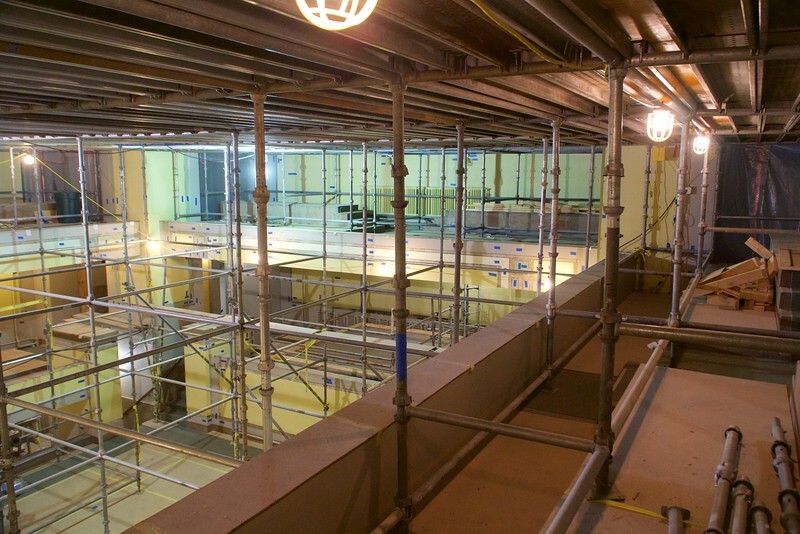 Scaffolding in upper west balcony of sanctuary. 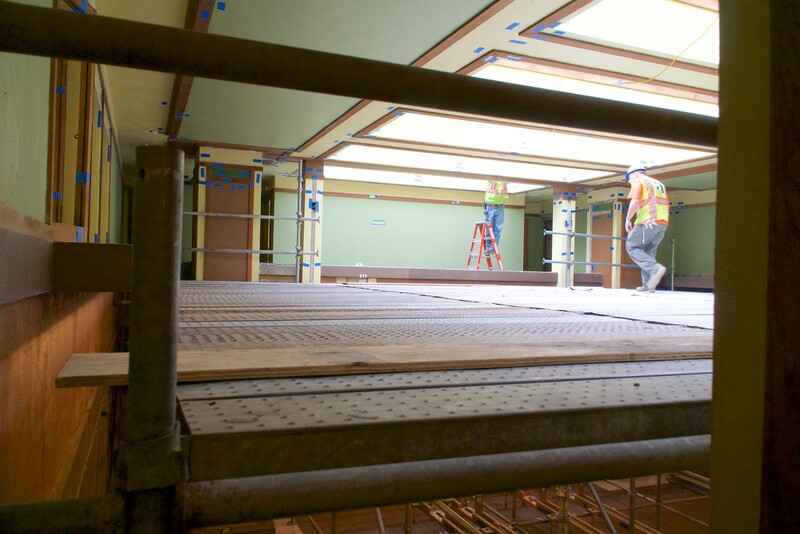 Here’s a snapshot of some of the work that’s been happening at Unity Temple. We are lucky at UTUUC to have several photographers documenting this process for us. In particular, we have Ralph Earlandson, a member of our communications committee, and Dan Crimmins, the president of our board of trustees. Dan took these photos at the end of August, 2015. Looking from the edge of the upper east balcony of Unity House into the skylight. 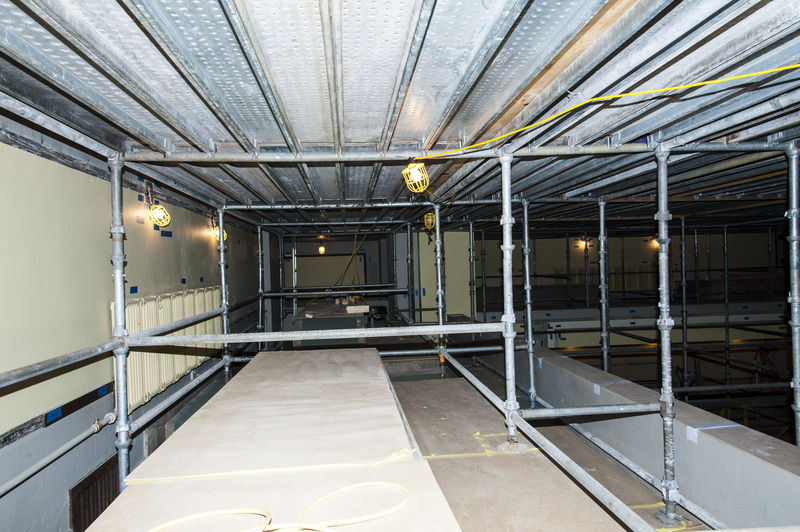 The lay lights have been removed, and workers are preparing for the removal of the remaining wood trim, the ceiling plaster, and the skylight itself. A new skylight will be installed in October, and it will have a lower profile that matches the light-colored peak above the circular opening. The view from the upper east balcony of Unity House over the “dance floor” toward the south wall. 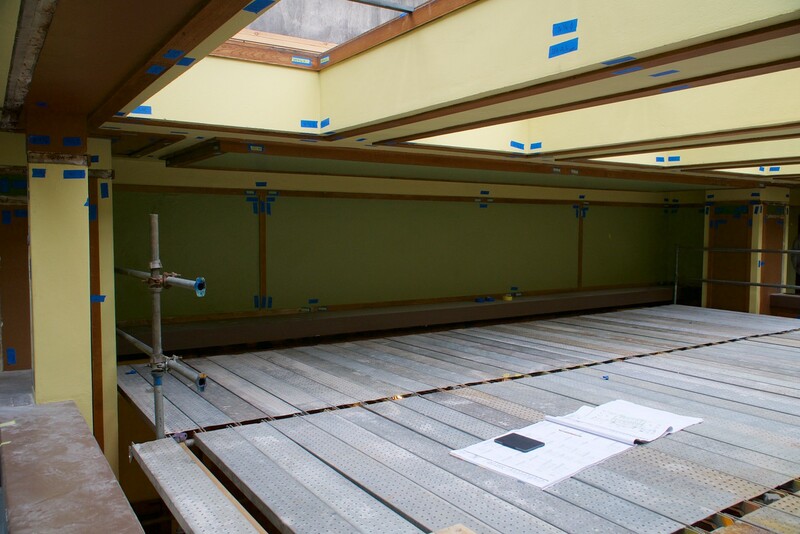 The dance floor is an elevated scaffold that allows the workers access to the full ceiling surface for removal of the trim and plaster. A carpenter removes nails and engraves identification numbers into the backing boards after oak surface trim is removed. The view here is from the upper east balcony of Unity House, looking across toward the west balcony where another crew is performing the same work. 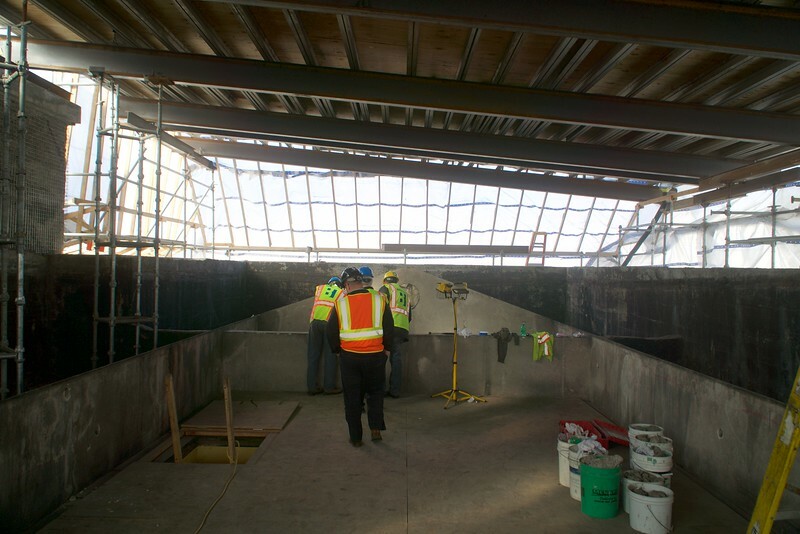 On the exterior of the building, loose, cracked and damaged surface concrete (called “shotcrete”) has been removed in a process called “chipping”. 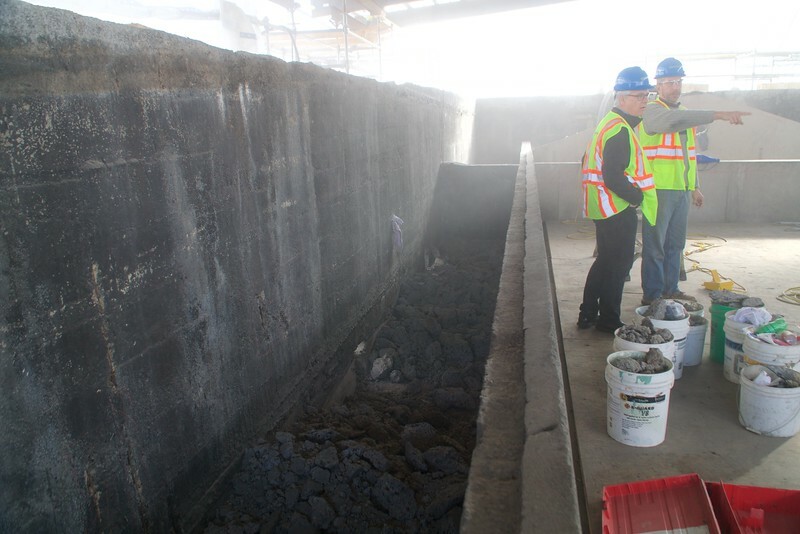 Revealed below is the original structural cinder concrete which will be prepared to receive newly applied shotcrete. 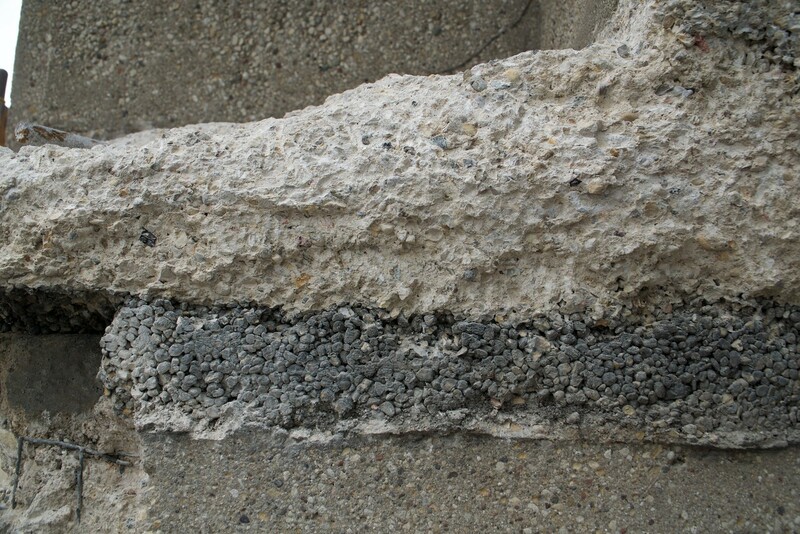 This photo shows the different concrete materials on the large planter near the east terrace. 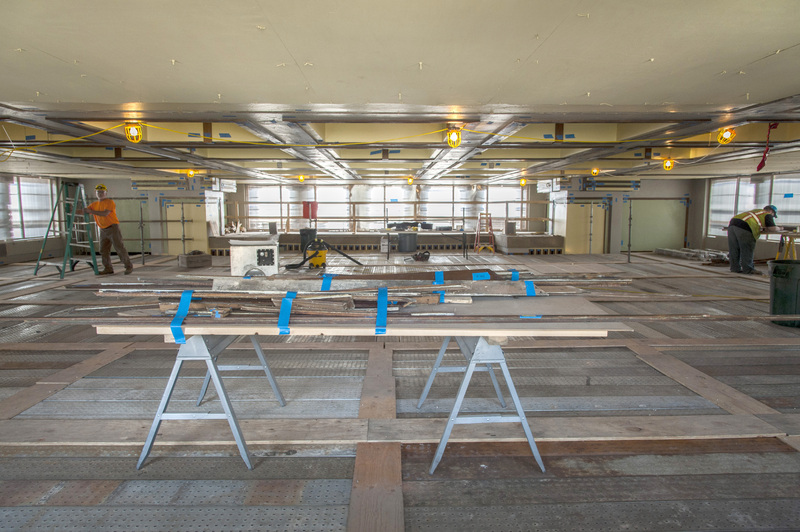 Carpenters document and remove wood trim from the ceiling of Unity House for restoration. The view is from the west balcony of Unity House, looking east. The familiar columns on the north side of Unity Temple, facing Lake Street. The art glass has been removed and sent to a conservator in Los Angeles; a protective piece of plywood is its temporary replacement. The columns are unique in that they are the only portion of the exterior surface that is original to the building. All other exterior surfaces were replaced in 1974 with the shotcrete that is now being restored. We’ll be sharing more photos soon! 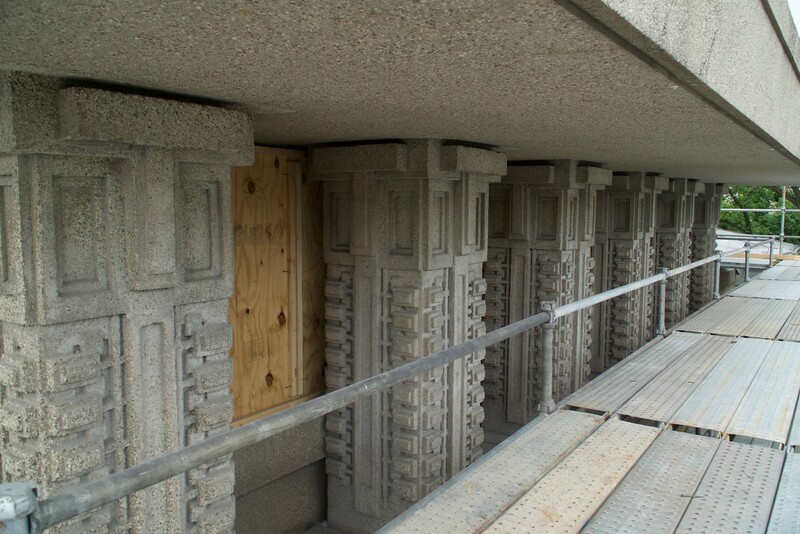 Restoring Unity Temple is quite a job, but we’ve been lucky with many aspects of the restoration. Our roots in Oak Park home mean that we’re surrounded by members of our congregation and friends in our community who know and understand the historical importance of Unity Temple. 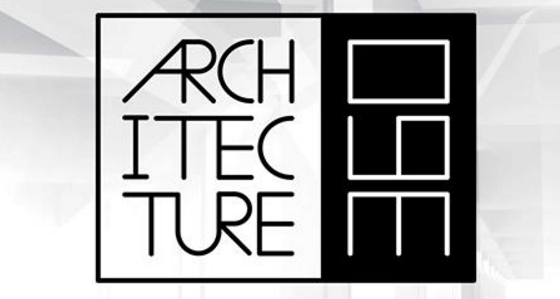 We also have a number of people who are really knowledgeable about the building. 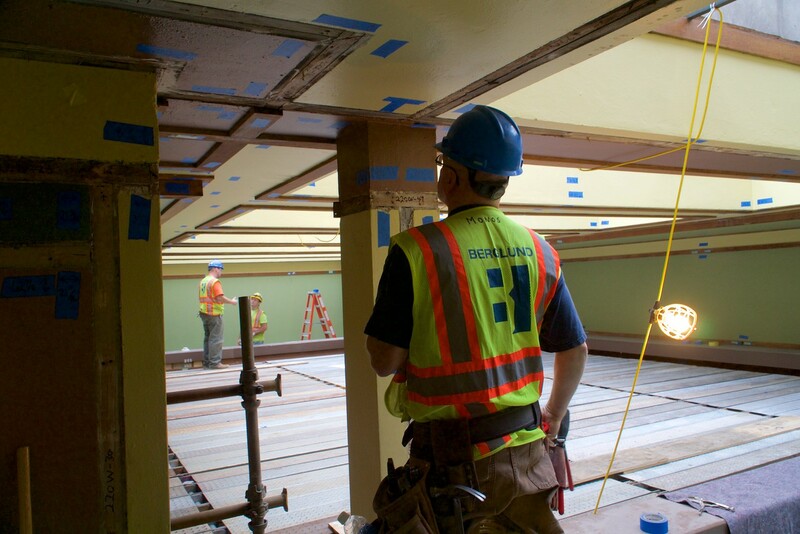 Many members of the restoration team have been working with Unity Temple for years. 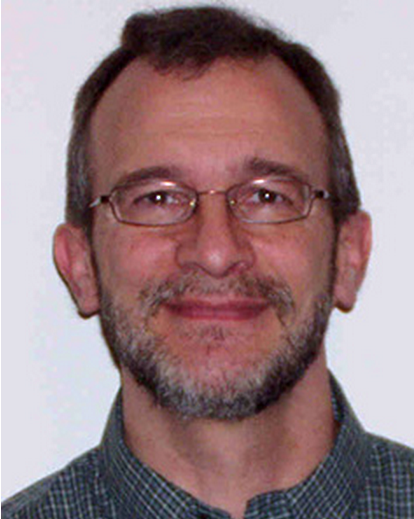 Mark Nussbaum is one of the members of our restoration team, and he’s been working with the building for many years. 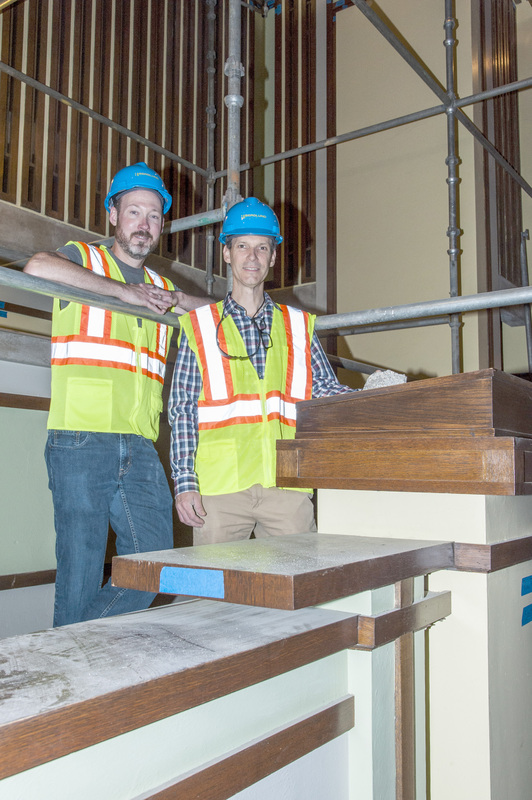 For Unity Temple, he’s leading the project to update our heating, cooling and water systems, including the main core of that project – our migration to a geothermal heating and cooling system. A geothermal system will use the deep earth temperature to circulate hot and cool air, as well as produce hot and cool water. According to Nussbaum, the system will heat water to 120 degrees and chill it to 44 degrees. Another goal of the new system is minimizing and managing humidity on interior walls. If exterior walls are kept warm, that warmth drives moisture to the outside. 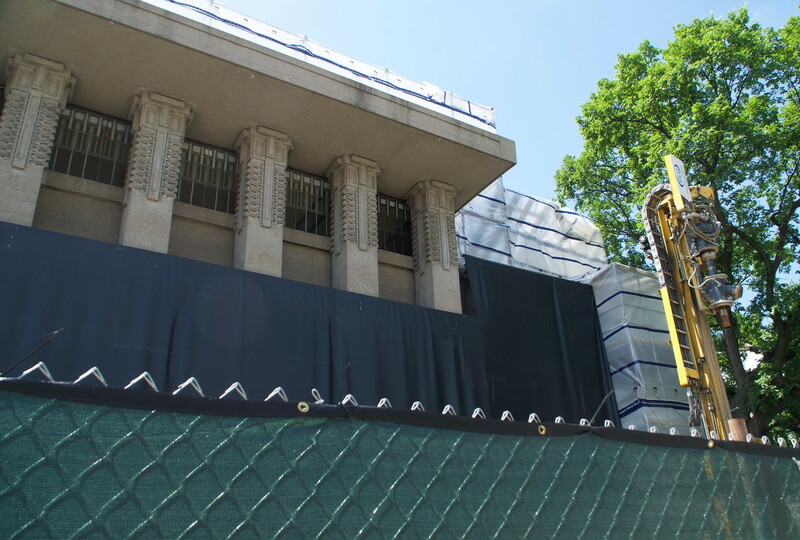 “Interior moisture definitely played a role in some of the external damage that we saw here [at Unity Temple],” he explained. The geothermal system has been in the works for a number of years; Nussbaum was part of a 2004 feasibility study to see whether such a system could be implemented. It’s been years of investigating, planning and researching, and figuring out how all the pieces fit together. 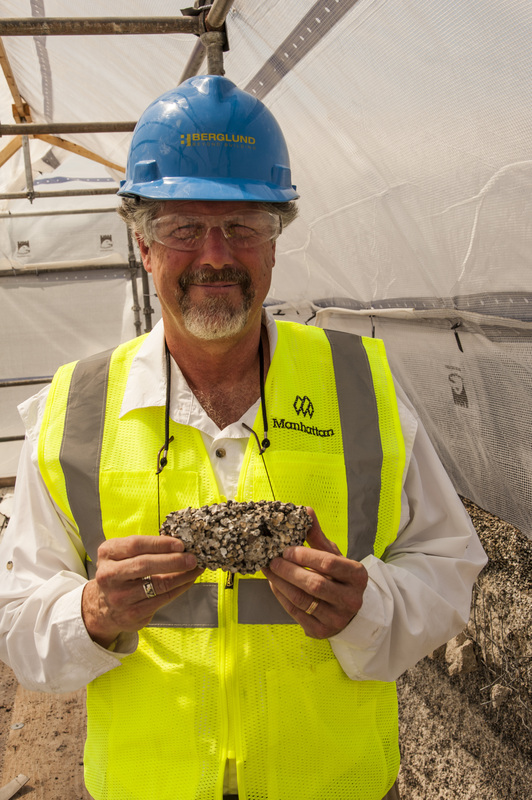 “The mechanical parts [coming together] is a big component of our work,” he said. Nussbaum and his team are also working on other mechanical elements. The lighting throughout Unity Temple will be connected to a central lighting control, with the capability to adjust and dim lights in different spaces. Lamps will be fitted with LED bulbs. The team will also be installing a new fire alarm system, and will add several exit signs. Nussbaum said that the signs will be added in the most discreet manner possible, in a way that will be subtle but still clearly mark exits and meet safety codes. Plumbing is another key element, with additional storm drainage and some modern piping added to the building for bathrooms and the kitchen. (Renovation of the kitchen is part of a separate project.) The classic restroom fixtures will remain. Nussbaum explained that opening our spiritual home to tours was a big impetus for looking at elements like exit signs, to ensure that people unfamiliar with our space will be able to safely find an exit.